IF NEW WASH CONTAINS NO DETERGENT, HOW DOES IT WASH? • Sodium Laureth Sulfate causes split or fuzzy hair, swelling of the arms, face or hands, irritation of the scalp and eyes. Generally considered safe at a concentration of 1%, higher residual levels in the body may result over time. Household soaps may have a concentration as high as 30%. • Sodium Lauryl Sulfoacetate is slightly toxic when ingested at a test concentration of 12%, slightly irritating to eyes at 3.0%, and a mild to strong skin irritant at up to 2.0%. • Sodium Lauroyl Sarcosinate can enable the penetration of other ingredients through the skin. • Sodium Cocoyl Isethionate is a mild irritant to eyes at a test concentration of 2.5%. • Disodium Laureth Sulfosuccinate may cause eye and skin irritation. • Cocamidopropyl Betaine may cause an allergic reaction after repeated exposure. New Wash cleanses with a proprietary blend of essential oils and naturally derived saturated cleansers instead of detergent, and is 100% biodegradable. We list every ingredient on our site, including those in our naturally-derived fragrance. Roll over them with your cursor to see why we included them, and how the EWG (Environmental Working Group) rates their safety. 1 is the least toxic, and 10 the most: New Wash is as good as it gets. So, shop for New Wash (Original), (Deep) or (Rich) with a clean conscience. DIVE DEEP INTO THE PHYSICS AND CHEMISTRY OF WASHING WITH MAURICIO BELLORA, DOCTOR OF PHARMACUETICAL & BIOCHEMICAL SCIENCES. In this paper we will discuss the aspects of Physics and Chemistry involved in washing hair. We will briefly explain concepts like superficial tension; surfactant properties; saponification; wettability; philicity; micelle, and other physicochemical phenomena. We will introduce some basic biology that will help understand hair behavior. We will describe the model that explains the mechanism of action of New Wash; in addition, we will compare the advantages of using New Wash to the detergents present in shampoo. We tested New Wash’s cleaning power under very extreme conditions. We will present original data that shows a macroscopic evaluation of the protection of color on hair when using New Wash compared to two well-known “color preserving,” high-end shampoos. Phase: A system of identical physical properties regardless of location within itself. A system constituted by one phase is called “homogenous.” If a system is constituted by two or more phases, it is called “heterogeneous.” Later in this paper we will use the concept of a heterogenous system with more than two phases to explain the dynamics of washing hair. When a heterogenous system is defined in the space, there will be at least one surface created and with it, an interphase. Even though the word surface is very common, it is not easily defined in physics. The simplest definition would be: the region that divides one phase from the other in a system. The intensive properties at both sides of the surface will be different. The Gibbs’ phases rule says, “The degree of freedom of a system will be equal to the number of phases in it.” The surface of the interphase will be defined by a force, called “interfacial tension” that keeps the molecules of the boundary connected. The interfacial tension is unique and fixed between two fluids at constant P and T.
As mentioned, surface tension is a force and will affect the shape of a fluid’s surface. Surface tension (g) will have a direct relationship with surface potential. Surface potential is very important in understanding how a fluid is going to perform when in contact with a solid phase. If the liquid’s surface potential is lower than the solid’s, the liquid will spread. If the solid’s surface potential is lower than that of the liquid, the fluid will lock and roll away. 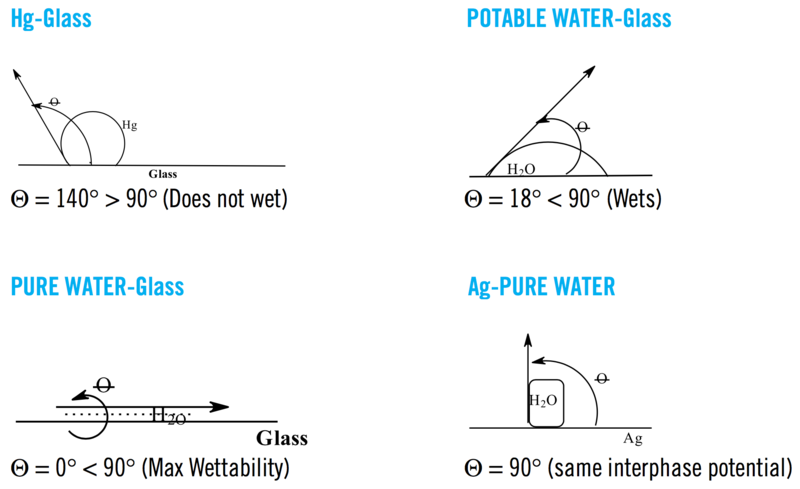 In 1804, Thomas Young described concepts like angle of contact, wettability and surface tension. His work was completed a year later by Pierre Simon Laplace who worked in the significance of the meniscus radii in capillarity (capillary action). These three concepts will rule many phenomena occurring between phases and on the surface. It might seem a bit out of order to bring these issues to this paper, but these concepts are highly important to understand the dynamics of surfactants, detergents and the cleaning power of the hair products that we will analyze. If our hands could not get wet, then we would not be able to wash them, nor could we dry them if the towel could not also get wet. In other words, if the wettability of the towel is lower than the wettability of our hands, then we will not be able to transfer the water from the hands to the towel. Later we will discuss systems like Hair-Dirt that have very low wettability, and ways to overcome that problem. We are also going to explain how the common solution appears to be an overuse of force that drives the hair into a vicious circle. The wettability of a given surface depends on the relationship of the superficial tension of boundaries between the adjacent phases. This relationship is a function of the intrinsic characteristics of the materials in question. One can predict the wettability, and thus the relationship of the superficial tension between two phases, with a simple observation of the angle of contact of the system. The angle of contact is defined as: “The angle, in the liquid phase, between the solid-liquid surface and the tangent of the gas-liquid surface.” [Surface Tension and related Thermodynamic Quantities in Aqueous Electrolyte Solutions, Norihiro Matubayiasi]. The following examples will illustrate the definition above and can be recognized as events of everyday life. Summarizing, if the angle of contact is < than 90° the liquid will wet the solid; if the angle of contact is > than 90° the liquid will not wet the solid. If we apply the concepts above to the idea of a system of Hair-Dirt-Water, what we need to do is to wet the system decreasing the angle of contact and consequently the surface tension of the interphase. The question we are going to ask and answer later is: To what extent should we decrease the surface tension to clean without stripping the hair? It is also common to classify substances by the contrary, or the lack of affinity. The suffix “phobic” comes from the Greek word “phobos” meaning “fear.” Hydrophilic molecules will be called lipophobic, and the lipophilic substances will be called hydrophobic. As expected, the affinity of a molecule will be a function of its atomic structure and of the strengths of the electrical (ionic) charges present. 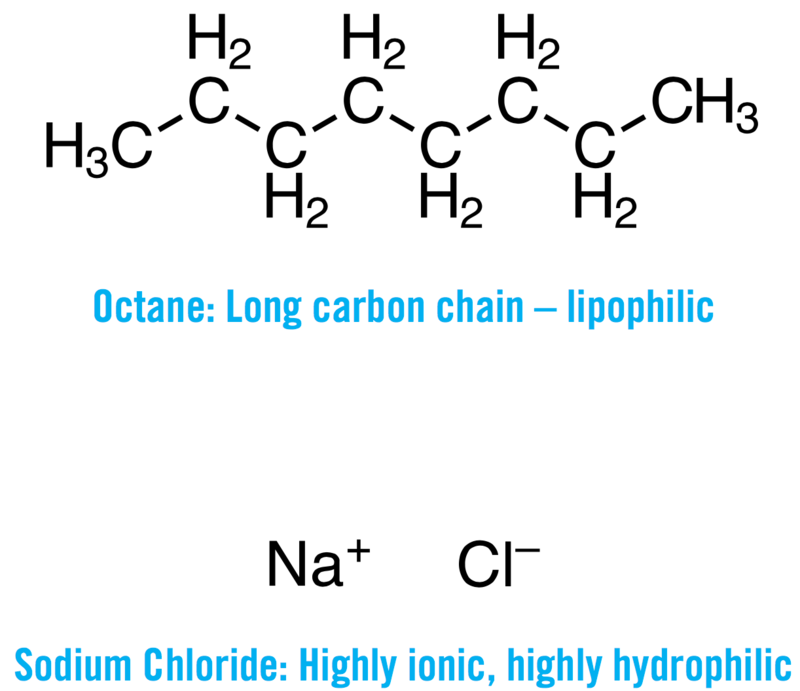 The general rule is a direct proportion of hydrophilicity to the ionic power of the molecule and a direct proportion of lipophilicity to the number of carbon atoms of the molecule (length of the carbon chain). Using this rule, it is easy to deduce that molecules with a long carbon chain and strong ionic ends will be amphiphilic. Amphiphilic molecules will be the backbone of our discussion about washing hair and the aggressive cleaning that the most common surfactants perform. Tensioactive molecules, also called surfactants, have the ability to decrease the surface tension of a fluid, increasing its wettability. The words surfactant, detergent and soap are often used as synonyms. That is a fundamental mistake. 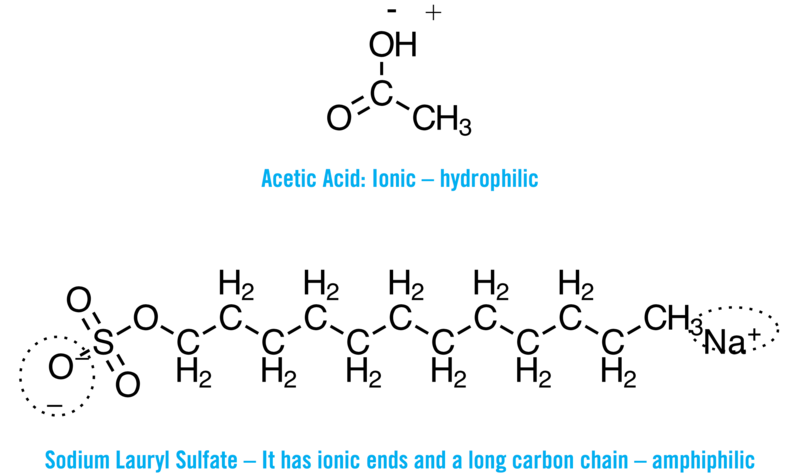 While surfactant refers to the property of being tensioactive, soap and detergent (solid and liquid respectively) are the resultant molecules of a specific chemical reaction: saponification. All detergents are surfactants but not all surfactants are detergents. It is very important to keep this in mind to understand the proposed model of action of New Wash, a non-detergent surfactant. As said, to be a soap or a detergent (referred to here as detergent), a molecule should be the final product of the reduction of an ester from glycerol and fatty acids. The final product obtained depends on the fatty acid used in the esterification of the glycerol, but we can say that, despite some molecular differences among detergents, all of them share a strong lipophilic carbon chain and a strong hydrophilic ionic end. For the sake of our discussion, it really does not matter if the detergent is sulfate free, a glucoside, or an amino. All detergents are strong surfactants, and as such we will see how they potentially damage the hair.